It’s 106 miles to Chicago, we got a full tank of gas, half a pack of cigarettes, it’s dark… and we’re wearing sunglasses, oh no, wait, wrong quote. It is however dark, very dark (we aren’t wearing sunglasses, thankfully, we are in the, so hip it hurts, Last Word on Edinburgh’s St Stephen Street. A lovely underground cocktail bar, light mainly by tea lights and all comfy window seats and leather chairs. A great setting for the Midnight Launch of the newest peated release from anCnoc – Cutter. With the #lightondark this seemed a particularly apt setting. We have been super excited about this release all week, what’s not to like, cosy bar, great cocktails (well we had to pass the time somehow), secret midnight release on a school night, amazing people and fantastic whisky! Hitting general release today, Cutter is the most peated release so far, with a phenol content of 20.5ppm and bottled at 46%ABV with a retail price of £52, and as with the other releases Rutter, Flaughter and Tushkar, the releases are all named after peat cutting tools. The Cutter is a hand tool used to cut peat from less wet, shallower bogs. This means the peat it reveals is drier and therefore more easily burnt producing a whisky that has a heavy smokiness. We were lucky enough to be joined by not only, Stephanie Bridge and her team, but Cutter was presented to us by Mark Williamson, Master Distiller for Inver House Distillers, who talked about the whisky and how they found the casks. Although it was hard to see, Mark explained that Cutter was a pale gold, reflecting the maturation style. When it came to selecting the casks, they came across some that were unmarked, and so, being completely lead by nose alone, it was up to the team to work out what they were. It was decided, once they had been thoroughly nosed, that they were American Oak Hogsheads, possibly third or fourth refill bourbon casks and it was in these casks that Cutter spent ten years or so waiting. The malt for this spirit starts with a phenol level of 50ppm and it was the challenge to get the perfect balance between age, character and not losing too many of the those lovely phenol’s. 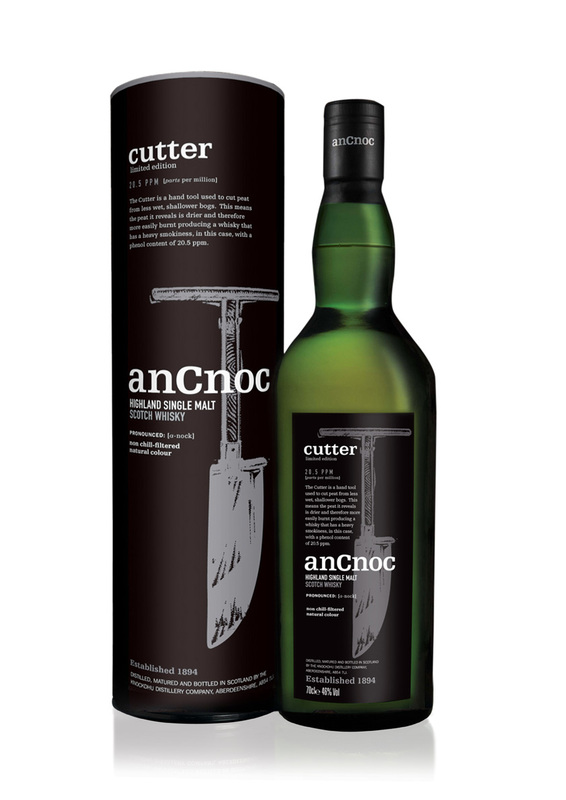 Mark and his team already knew the character they were looking to achieve, peaty and ashy, but still with sweet, fruity notes so familiar to the anCnoc range. Out of the six recognised types of phenols, it was the medicinal, heavy oily type that was sought for Cutter. Knockdhu distillery produce the anCnoc range, the village of Knock, Aberdeenshire, is relatively small, with 30 houses. The distillery was founded in 1893 by John Morrison, who bought the land from the Duke of Fife and once the site was surveyed and found to have an excellent source of peat, was in a fantastic location due to the railway and with a noted barley source, this made it the perfect site for a distillery which was built for the DCL. Knockdhu used to have its own maltings, but this is now locally sourced and with the peat coming from St Ferguson’s Bog, keeping it local is important. The style of the still which are almost 6 feet tall have a huge influence on the style of spirit produced. Giving the light, sweet, slightly citrus, floral flavours that anCnoc drinkers love so much. The whisky is aged in American and Spanish oak barrels, previously used to mature either bourbon or sherry and then stored in dunnage warehouses on site capable of storing up to 7,500 casks at any one time. Thick and oily on the nose, with a sharp medicinal phenolic layer, with ripe peaches and a touch of oak. Ashy, applecore and notes of leather and spicy vanilla, with some sharper pink grapefruit notes and ripe orchard fruits. Long and elegant with spice and peat that die out with a juicy burst. So time for our tasting notes. Medicinal and sweet, almost in equal measures, the smoke is ashy, peaty and dry. There is the sweet touch of vanilla sponge, a lovely sweet, eggy batter. The fruit starts to come through, manderins, logan berries and peach melba with dream topping. There is a gentle primrose and a touch of violets, tempered by a herbal, damp fern note. A smoke that is heavy to start and stays throughout, encircling the palate, kissing the roof of the mouth. Oily and mouth coating bringing with it lashings of vanilla fudge and condensed milk, before evolving into ashy, sooty, earthy smoke, drying the palate. The sweet notes are ample. Heather honey sweetness, with sticky orange marmalade and oriental, soft lychees, before sweet red apples caress the palate. There are a little cloves and heat with some lavender and jasmine and cereal sweetened milk. There is the smallest touch of rich, dry, oaky cask, before the oily chewiness returns. And whilst all these flavours evolve the peat and the smoke continue in varying degrees, take pancake batter and ashes, put them together and you come close to understanding the sweet smoke this dram produces, before the nutty dryness of walnuts and masonry dust. Long, oily and sweet, nutty and dry, ashy, you name it, it’s there. The subtle complexities keep you guessing right to the very end. This really is a dram you can lose yourself in. The peat, smoke and the sweetness move in perfect harmony, like watching a tango in Argentina, you become lost watching every move perfectly orchestrated. The gentle brioche sweetness draws you in like a gentle caress and the sweet, yet peated smoke keeps you firmly in the dark side. Ashy, sweet, medicinal, slight hints of peach and strawberry. Vanilla flavoured ice cream and milk chocolate buttons. Sweet, sweet, sweet! Lovely creamy texture tempered with a soft smoke that holds its own beautifully. Ice cream from the nose is still there and has been joined by orange, strawberries and a touch of mango. The smoke is always there, you know you are drinking peated whisky and you are loving it! Smoke stays the entirety, the sweetness falls away as the dram disappears. Absolute perfect marriage of highland and peat. Beautiful and finally great to see the actual ppm of the finished product known. No guessing games here, 20.5 is what it says and that’s what you get. Other distilleries should take note. Very nice write up on a very nice whisky. I couldn’t agree more about other distilleries coming clean about final (bottled) ppm levels. Glad you liked the write up. Really enjoyable whisky and a nice peaty change from the usual Islay malts. Would be nice to see some more transparency about final peat levels.